UNIFREM 500 is the latest generation of frequency converters family. 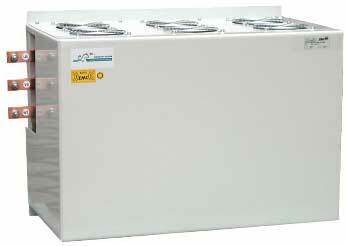 These converters are designed for motors rated from 15 kW to 200 kW and supply voltage of 500V. All UNIFREM converters allow vector control of both induction and synchronous motors: speed,torque and position control; and high performance scalar (V/f) control with slip compensation and many other features. They are designed to solve any drive problem in the most cutting-edge applications. The family is specified by its user-friendly settings and control, users are guided by the graphic control panel (UNIPANEL). The latest generation of power electronics ( SEMIKRON SEMiX or SkiiP®) has been used for minimization of losses. Grid disturbance is kept to a minimum. All drives are also available in VF version - for high-speed or special motors up to 3000Hz. UNIFREM VF converters allow independent setting of both output voltage and output frequency. UNIFREM converters include protection against overvoltage, undervoltage, current overloading of converter, short circuit between input phases and overheating. Input and output phase loss are detected as well. Overheating of motor is suppressed by calculating the heat integral of the motor. Built-in three phase input commutation chokes are lowering the harmonic distortion (EN 61800–3). Standard use of noise suppresing filters ensures minimal disturbance to the power grid (EN 61000–6-4). Use of the newest power electronics has lowered and minimalized converter losses and power grid disturbance. By the use of power optimized heat sink together with improved heat-transfer-targeted placement of power components smaller dimensions have been achieved. The latest generation power capacitors with extended operating temperature and lifetime by 20% as well as the newest power electronics components have been used. The cooling fans with high-quality bearings ensure longer lifetime and lower noise level. High performance vector control ( sensorless or with mechanical sensor ) of both induction and synchronous motors. Determined for application with requirements for very accurate speed control with special demands for high dynamic control. Automatic online tuning of the motor parameters (stator resistance, magnetic saturation... ). Designed for high-demanding applications with induction and synchronous motors, with high requirements for precise torque and speed control - traction drives, reelers... Position control with sampling period of 200 µs allows precise control of highly sophisticated applications. 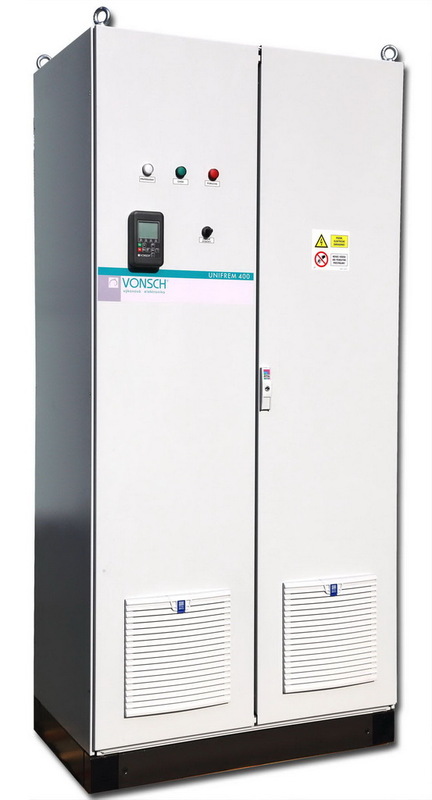 Our unique scalar control is targeted for applications with requirements to keep the speed constant and robust control without need for excellent dynamic response. Universally programmable a combinable logical blocks (AND, OR, NAND, NOR, XOR, RS flip-flop) – built-in PLC. Support of following industrial communication protocols: CANopen, MODBUS, PROFIBUS. Configurable history of faults, warnings and other events. Stores up to 1000 events. Application for configuration, diagnostics and archiving of settings to PC. It allows: firmware upgrade, process diagnostic "black box" data. Diagnostics of faults and events helps the operator to solve the problems and avoid the future ones. VONSCH declares the operation of UNIFREM converters in optional special version at operating temperatures from -10 °C to +40 °C. Output motor chokes are used in case when the distance between the converter and the motor is higher than 100m (non-shielded cable) or 50m (shielded cable). Cable capacitance effects are eliminated by the motor choke or sine filter. Ensures dissipation of kinetic energy in the regenerative mode of motor operation. Sine filter filters the output PWM voltage of the inverter to the sine wave of variable frequency and amplitude. This will limit the peak current and capacitive motor insulation stress. When using the EMC sinus filter, it is not necessary to use the shielded cable. It is necessary to set the switching frequency of IGBT power elements to at least 4 kHz, when using the Sine filter! 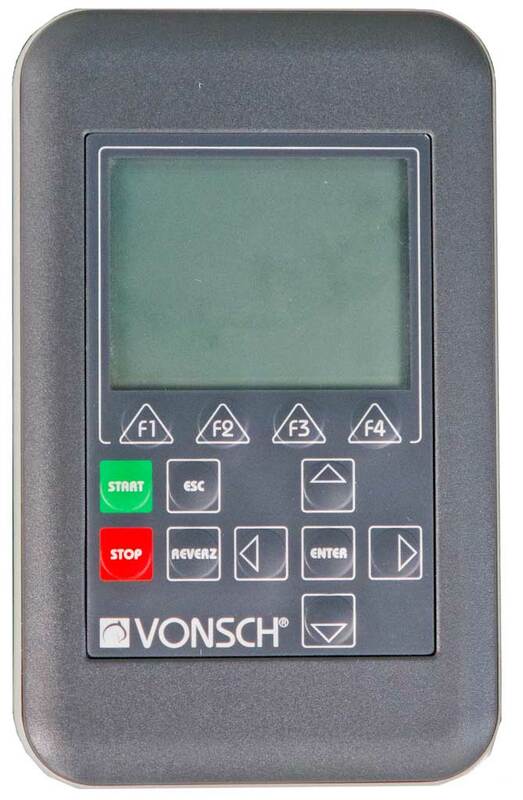 UNIPANEL is universal handheld control device for the whole latest generation of VONSCH products (QUATROFREM, UNIFREM, FOTO CONTROL ... ). Panel may be assembled directly to the enclosure or may be connected by wire (max. length is 100m). 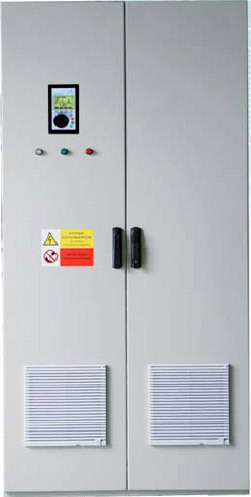 UNIPANEL uses CANopen as its primary communication protocol with the inverter. Maximal number of 99 devices may be connected to UNIPANEL. User can choose which device (inverter,controlled rectifier, other product) will be controlled and monitored. USB port serves as communication port with PC. UNIPANEL does not serve only as monitoring and configuration device, but as backup&restore manager too. Fully graphical display shows the description and brief help to all the parameters. All the parameters and variables may be monitored in real-time and plotted into the graph. Extension module RM-UNI_IRC1 for the UNIFREM main board. Incremental encoder (IRC) is connected to the terminal marked on the IRC module. It is used for speed, torque or position closed loop vector control. 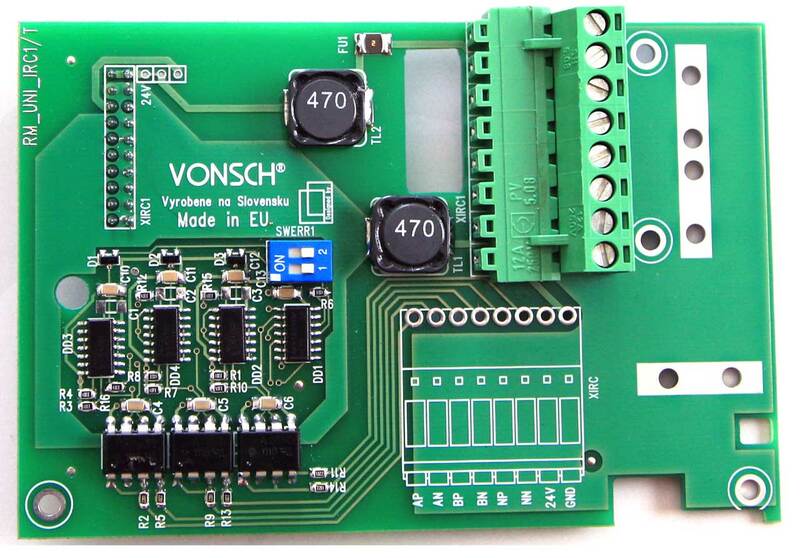 To connect to the module push-pull rotary encoder incremental encoder HTL with 24Vdc power supply is used. 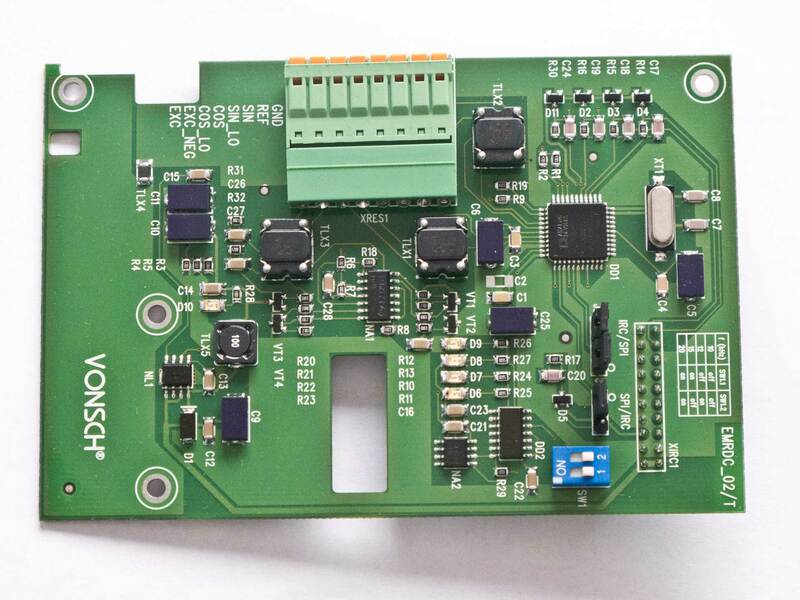 Extension module contains special circuits to detect and evaluate some errors such as faulty electrical signals or disconnected encoder from the rotor. Extension module RM-RDC for the connection of resolver to the UNIFREM main board. The sensor is connected to the terminal marked on the module. It is used for speed, torque or position closed loop vector control of both, synchronous and induction motors. 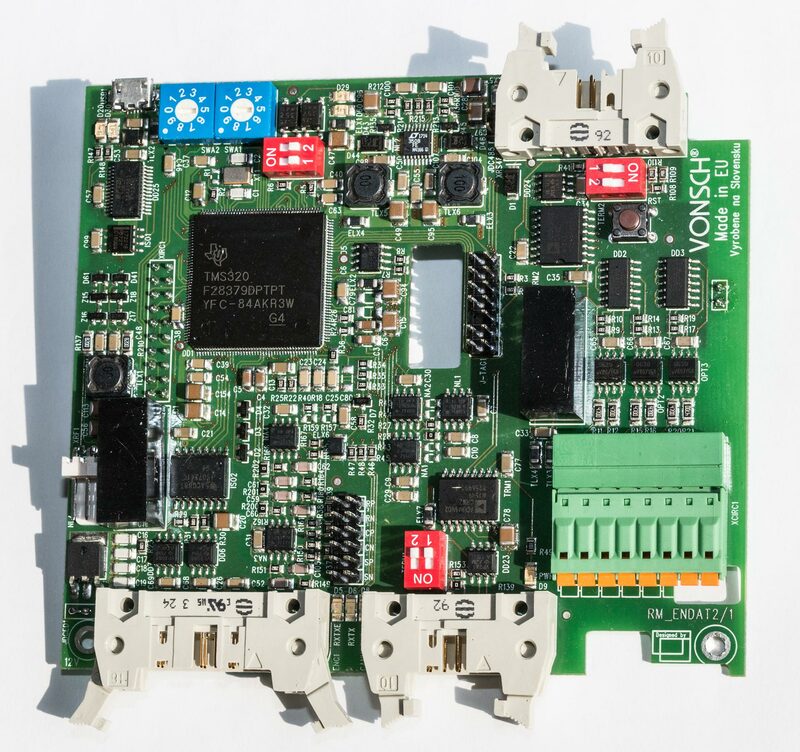 Extension module includes special circuits to detect and evaluate some errors such as faulty electrical signals or disconnected encoder from the motor shaft. Profibus_UNI extension module is used for connection of the converter to PROFIBUS DP network. Profibus DP (Decentralized Peripherals) is the simple and most widely used version of Profibus designed for fast master - slave communication. Communication medium is twisted pair (RS-485 standard). The RM-SERVO extension module is used to connect absolute position encoders and to interconnect multiple RM-SERVO expansion modules for multi-axis synchronization. RM-SERVO supports several types of absolute position encoders like ENDAT, sin / cos and others. If you require a converter of similar type, but out of range shown in the table, please contact our sales department.